Contest: WIN: A FREE CUSTOMIZED HOCKEY JERSEY! 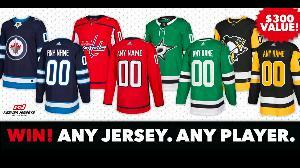 WIN: A FREE CUSTOMIZED HOCKEY JERSEY! Prize: Win a custom jersey from Keener Jerseys! Any Jersey. Any Player. Up to a $300 value. Statistics: This contest was opened by 136 and entered by 20 ContestChest.com members. 15% of those who opened the contest, entered it.